Well, the electrician actually showed up on Friday. Woohoo. 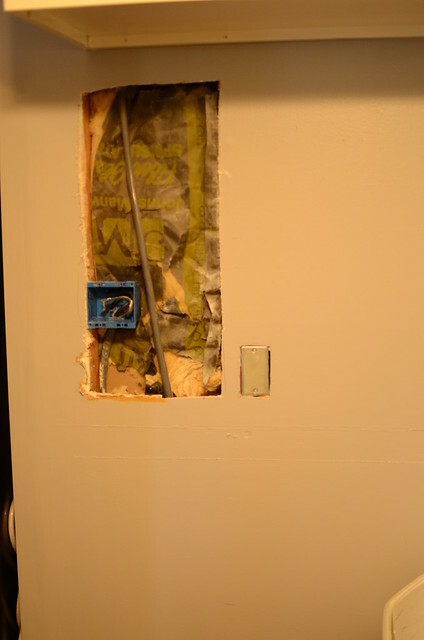 He moved some light switches, installed the outlet for the oven, moved an outlet, and installed a new switch and light in the garage. Plus he fixed a switch that was not working properly. Here are some photos of the destruction. 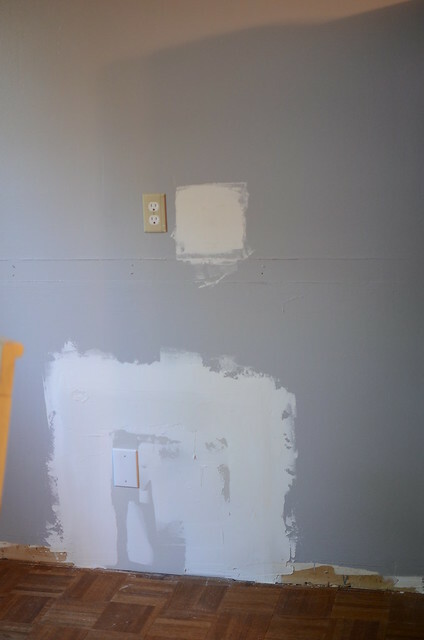 Mitch has already patched the drywall here. 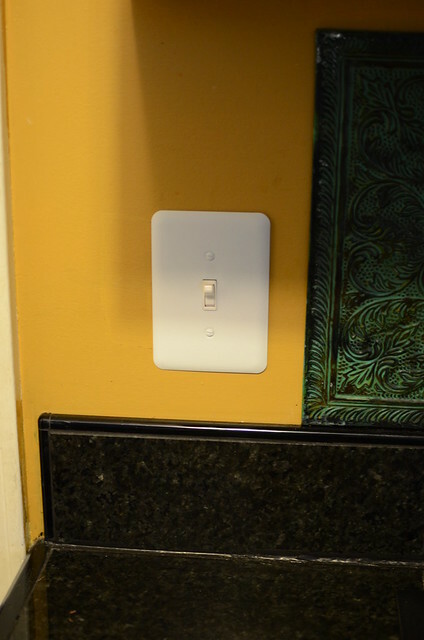 It is so nice that the light switches are in the correct place now. The next step is going to be to build a cabinet for the oven. Then build out around the fridge. This is what we have in mind. Now we need to decide if we are going to move the microwave over the oven or keep it over the range. I am leaning towards a small microwave or no microwave. Decisions, decisions. Mitch and I have to be the most indecisive people on the planet. The laundry room is almost finished. Mitch installed the floors and trim this weekend. We had some major issues with the riser that Mitch built. It was about half an inch too big for the space. We realized that he built it before we decided we were going to build the wall to enclose the space. Sigh. Mitch removed some boards and we were actually able to fit it into the space, but realized it would be really hard to move the washer and dryer once they were on the riser. The washing machine is very heavy. He put castors on the riser, but I was afraid it would move around too much. So after many hours with the riser situation, we decided to scrap it for now. If we decide to go with no riser, the shelf will be moved down. Next weekend the plan is to finish out some trim around the steps, then put up some hooks so we can start hanging coats and backpacks. We have a busy weekend planned, so we are keeping our projects easy. Mitch's table saw isn't working so he has to figure out what is wrong with it before he can build any cabinets. It seems like it is always something. It's looking good!! 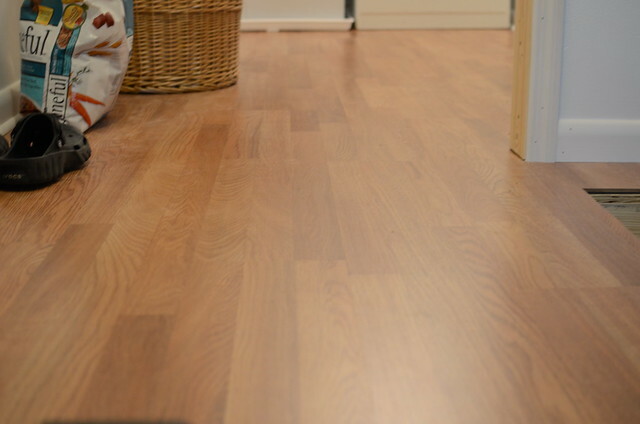 :-) And the laundry room is beautiful. Sigh. Would Mitch like a trip to California?? He does fantastic work. 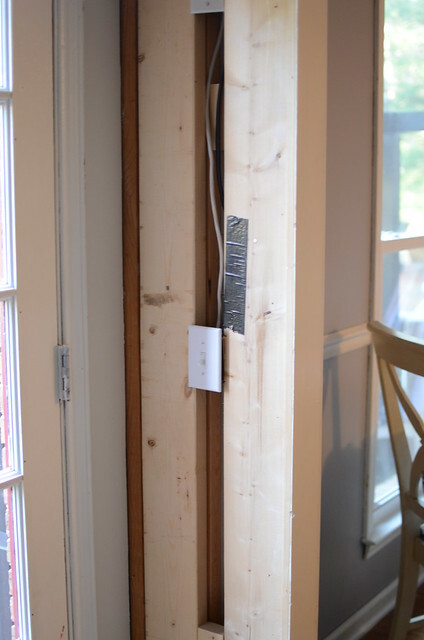 I need an electrician and woodwork and new flooring and...oh, the list goes on. 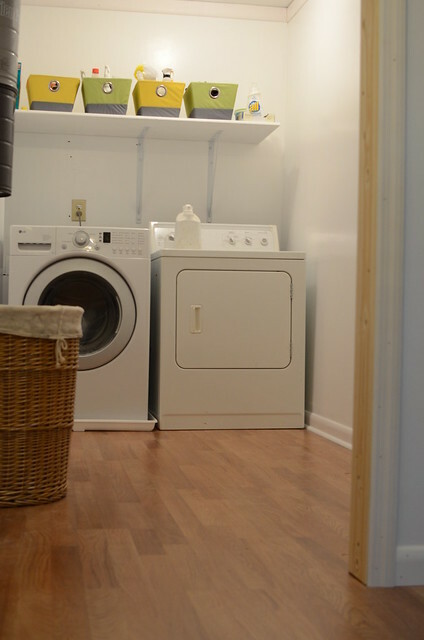 Your laundry room is looking great! Bummer about the riser, though. Ugh. So frustrating after the work that was put into building it. Yes, with remodeling, there is always something!